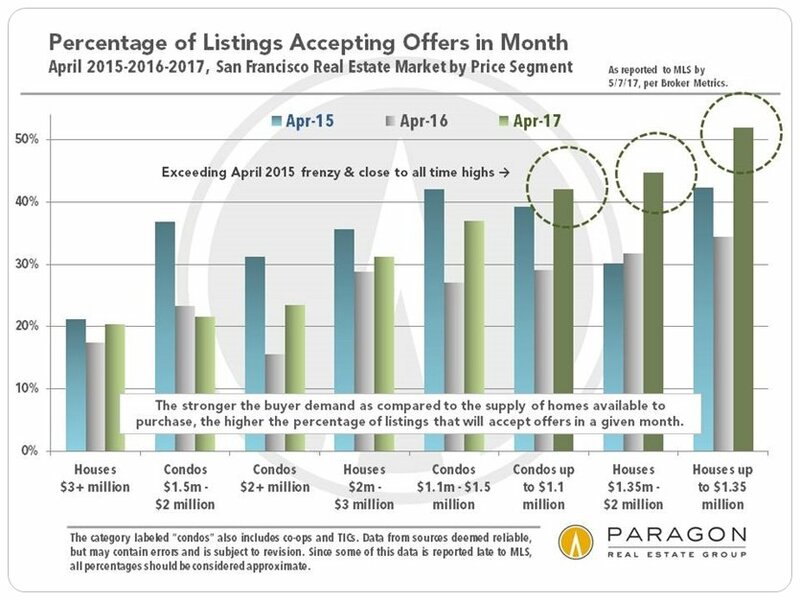 Many separate but connected events occurring in the global, national and local economy may have an impact on the San Francisco real estate market this year, the extent to which is unknown. These include a jump in the inflation rate, increased stock market volatility, the bond market sell-off, the weak dollar and talk of a fourth rate increase this year by the Federal Reserve Board. Home buyers are laser focused on mortgage interest rates, as well as how financially secure they feel with their investment portfolios. A gyrating stock market can not only reduce buyers’ ability to deliver on their downpayments but also deter their eagerness to make offers, let alone bid aggressively on them. 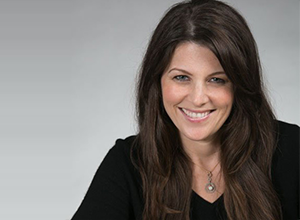 As mortgage rates rise, and perhaps even more this year than anticipated, it hurt buyers in terms of the amount they can qualify for and sellers in terms of the downward pressure it puts on home values. 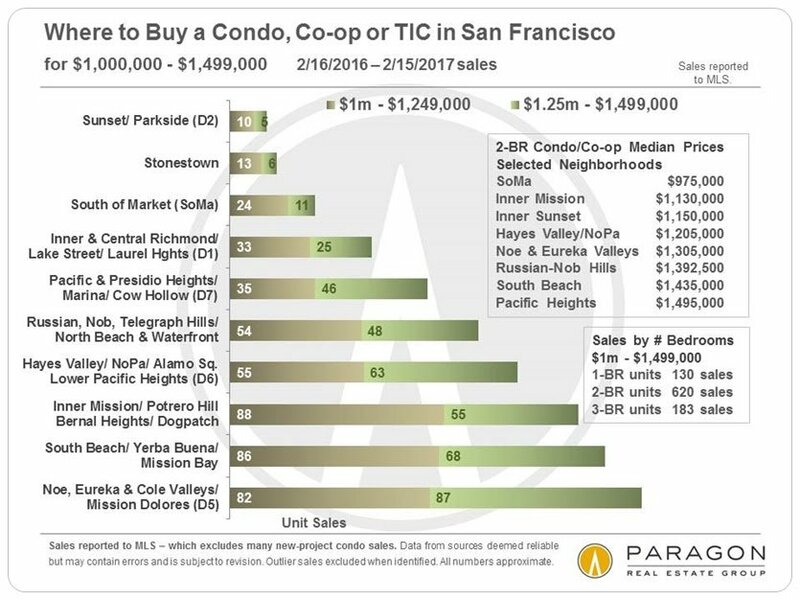 All that said, San Francisco still has a booming job market and buyer demand that well out-strips supply. It’s hard to imagine a truly shifted market place, yet these two sides may come a bit more into balance this year. The three-month rolling average median sales price of $1,350,000 is up 10.5% over last year’s. 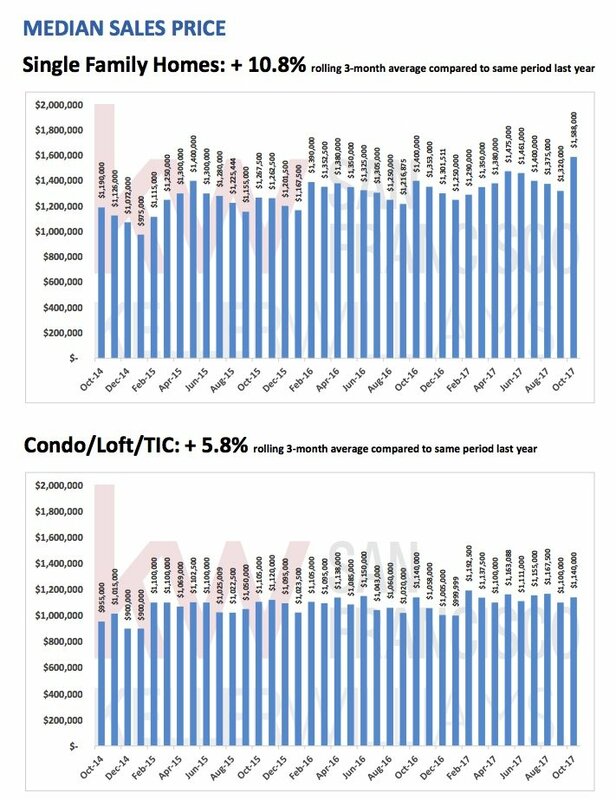 In the past 12 months, new listings were down 5.9% while sales were up 0.94%. January’s inventory of 1.1 months is 35% lower than in 2017. 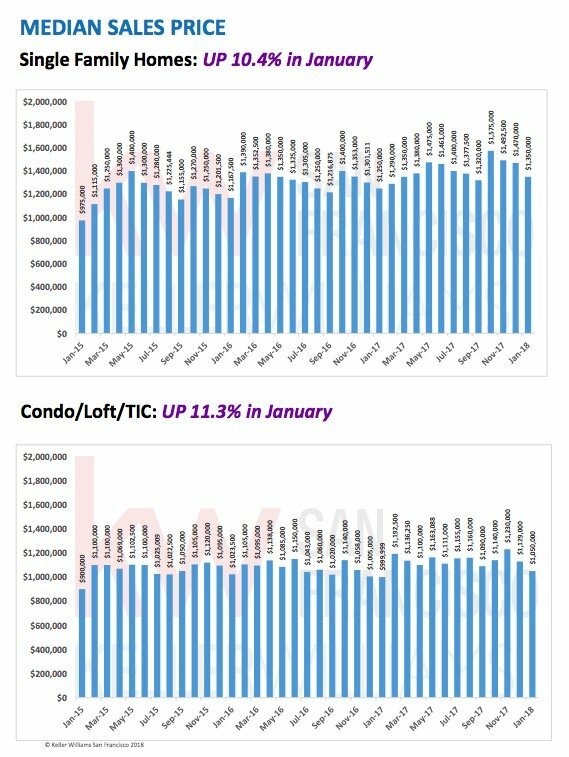 70% of homes sold over their list price and the median percent of list price received was 108% in January. The three-month rolling average median sales price of $1,050,000 is up 11.3% over last year’s. In the past 12 months, new listings were down 7.5% while sales were up 2.4%. January’s inventory of 1.6 months is 33% lower than in 2017. 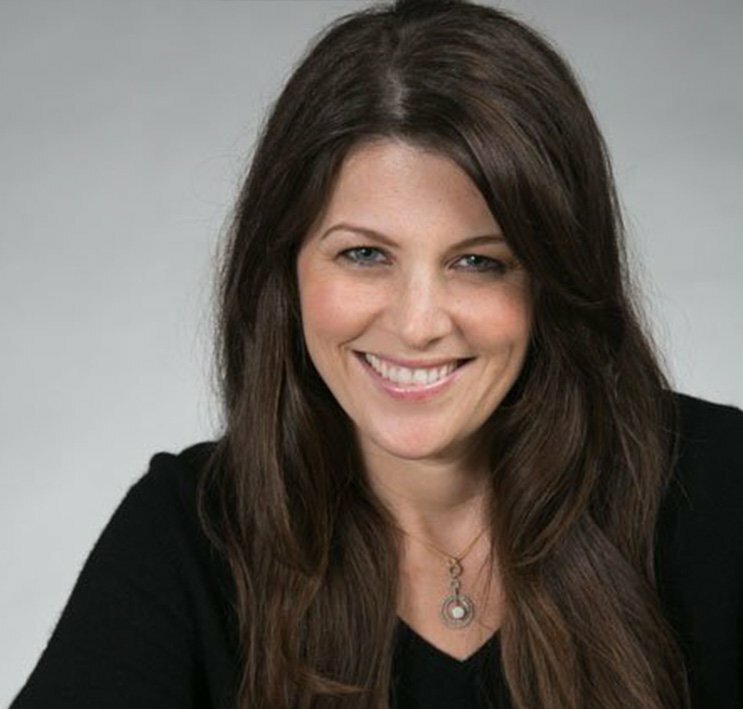 39% of homes sold over their list price and the median percent of list price received was 100% in January. 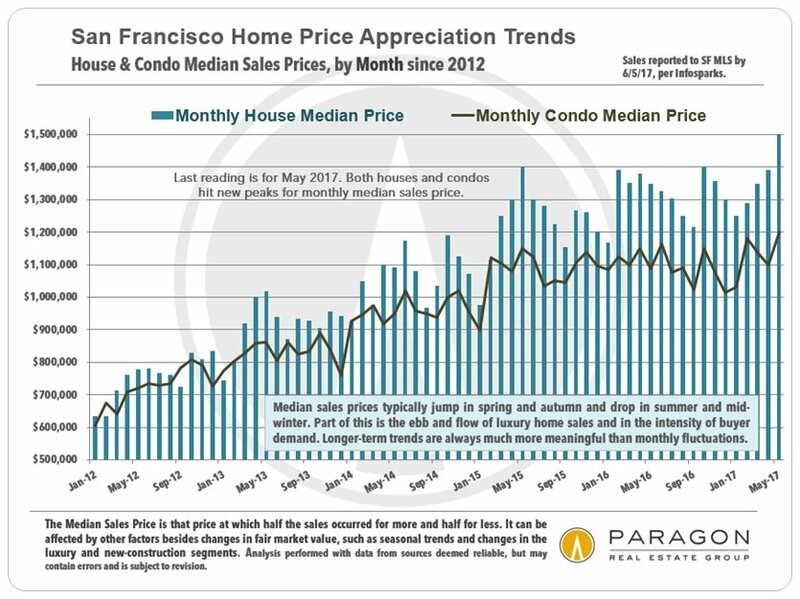 2017 saw two foundational trends continue in the San Francisco real estate housing market. 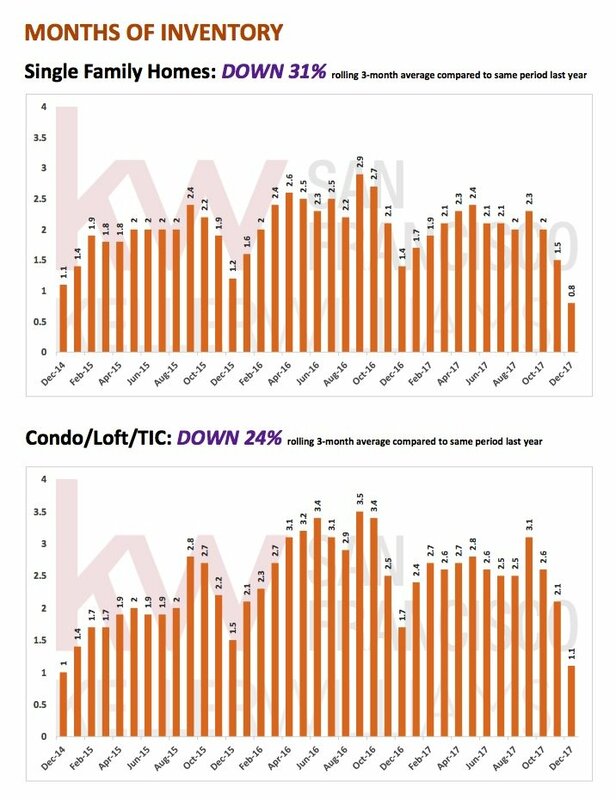 Prices continued their trend upward while inventory continued its trend downward. 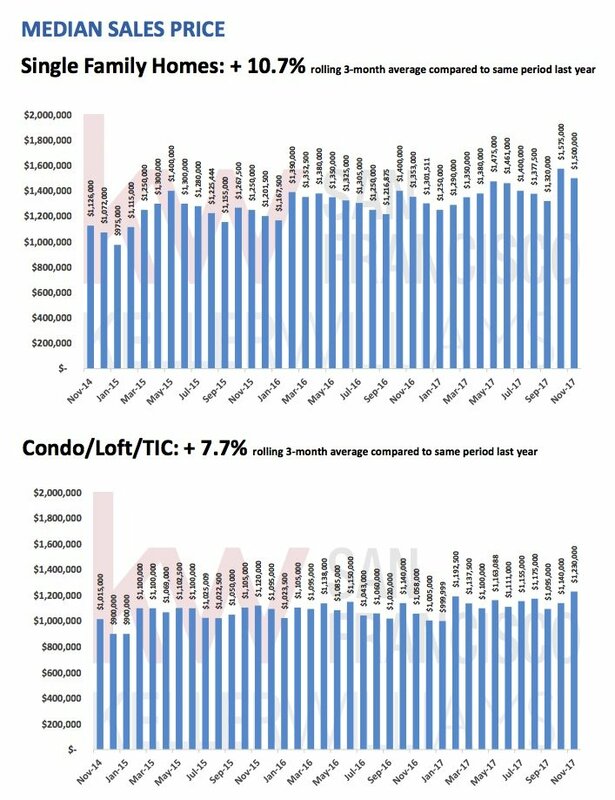 It marked the sixth straight year for higher sales prices for both single family homes and condo/loft/TIC’s. Two changes, one already implemented and one in the making, may have a significant impact on the housing market, in San Francisco and across the country. First, the tax changes may impact buyer behavior with the reduction in deductibility of mortgage interest and possibly state income taxes and property taxes, with the latter two still up in the air. Second, the projected three hikes in the federal funds rate by the Federal Reserve are anticipated to result in mortgage rate increases of ½ to ¾ percent by the end of 2018. Additional factors will affect mortgage rates so it’s impossible to predict where they’ll end up and how they’ll get there. No expert expects them to stay as low as they are currently. 2017’s median sales price is up 12.2% from 2016. 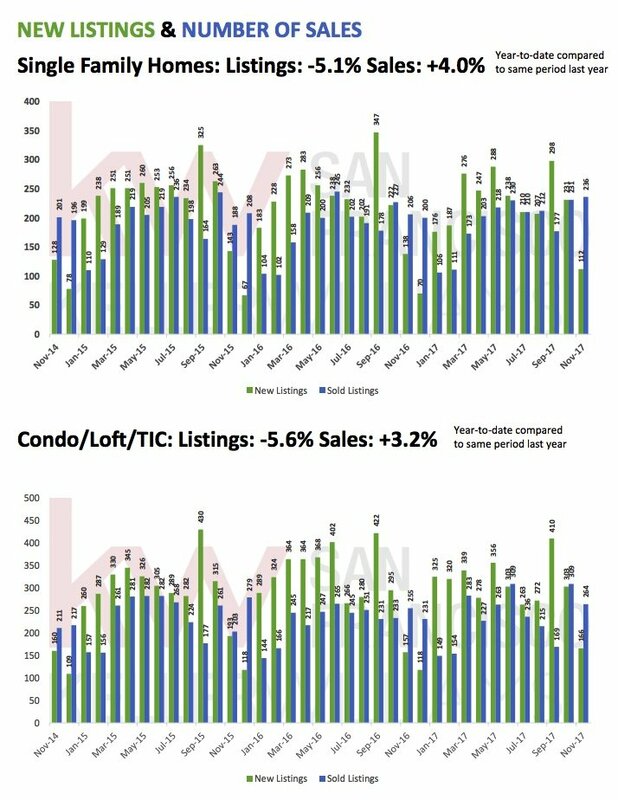 There were 5.5% fewer new listings in 2017, and 1.5% more sales. Inventory ended 2017 down 31% from 2016, the lowest level in 10 years. 78.7% of homes sold over their list price and the median percent of list price received was 113.4% for 2017. 2017’s median sales price is up 9.3% from 2016. 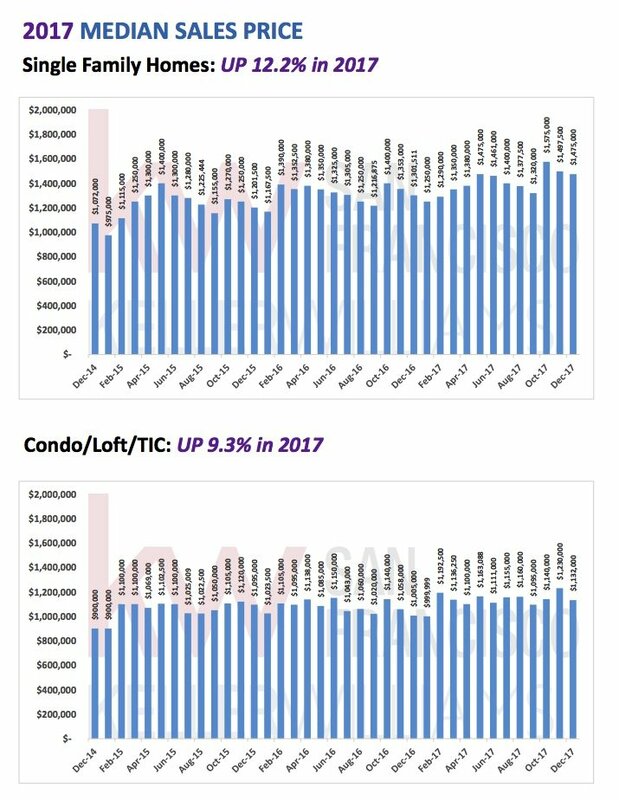 There were 6.2% fewer new listings in 2017, and 3.4% more sales. Inventory ended 2017 down 24% from 2016, the lowest level in 3 years. 59.5% of homes sold over their list price and the median percent of list price received was 101.9% for 2017. 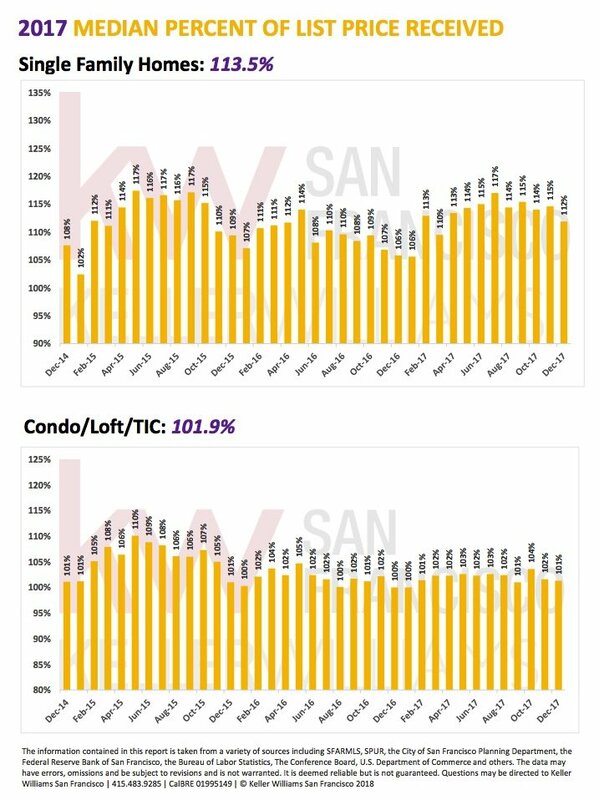 The November San Francisco real estate market moved along pretty much as expected, with continued low inventory and the majority of properties selling above list price. 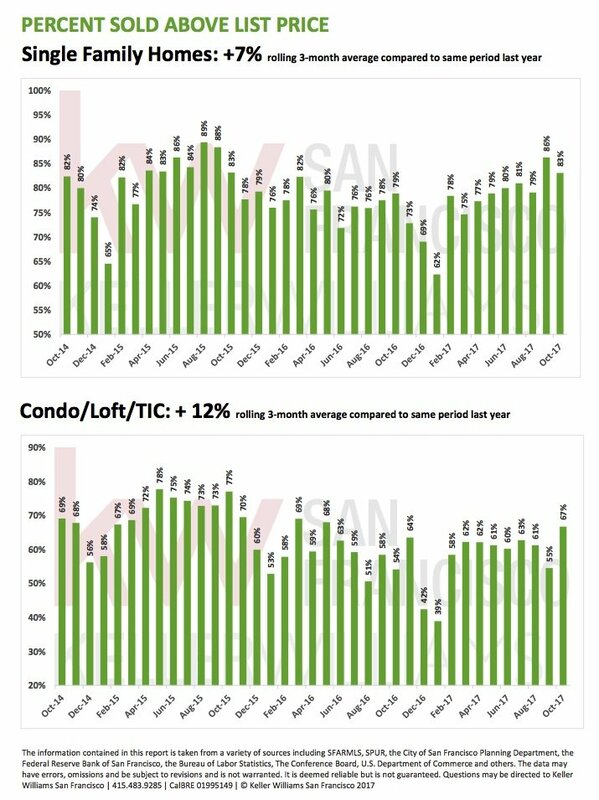 Condo prices hit an all-time high of $1,230,000. November’s median sales price eased off a bit from October’s all-time high of $1,588,000, down to $1,500,000. However, prices are still up 10.7% compared to last year. 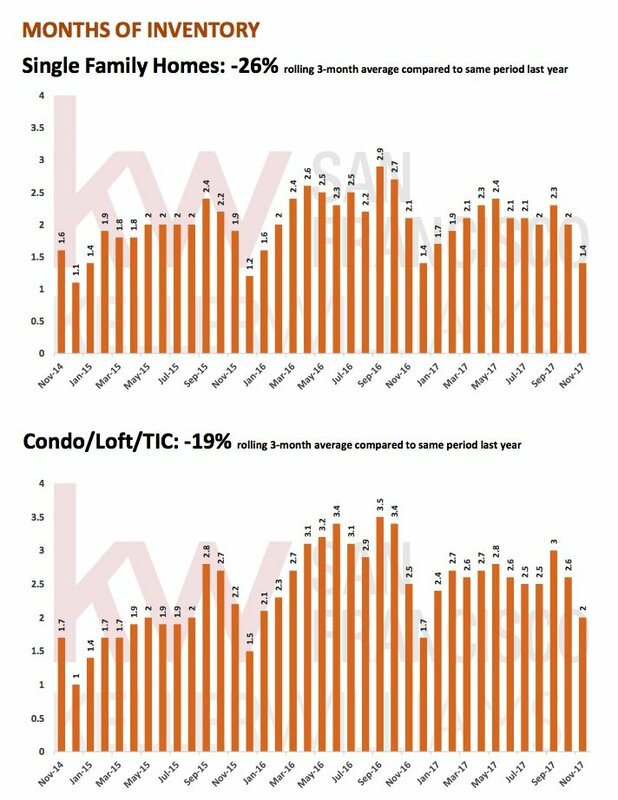 While new listings typically fall off in November, this year’s were exceptionally low at just 112, 19% fewer than last November. 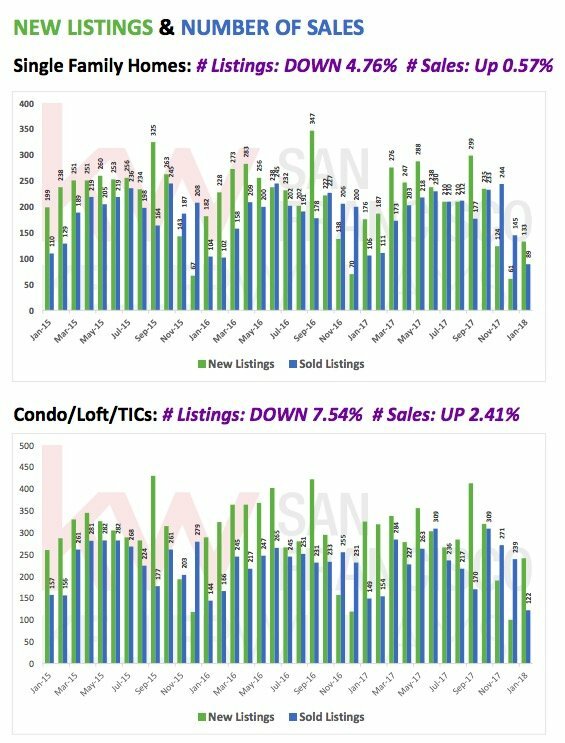 The number of new listings on the market year-to-date is down 5% from 2016 while the number of sales is up 4.2%. Inventory remains very low at a 1.4 months supply, the lowest level since December 2016. 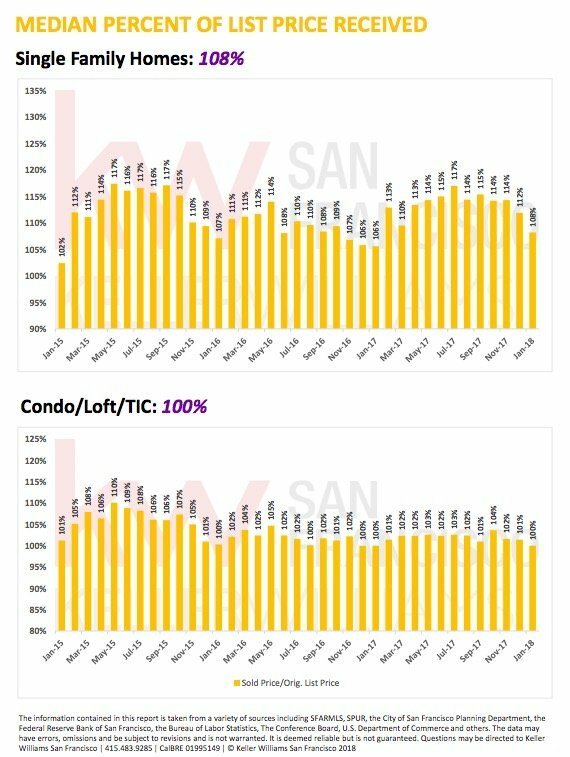 The incredibly tight supply coupled with strong demand kept the level of overbids high as well, staying at 115%, much higher than last November’s 107%. 81% of single family homes sold above the list price. 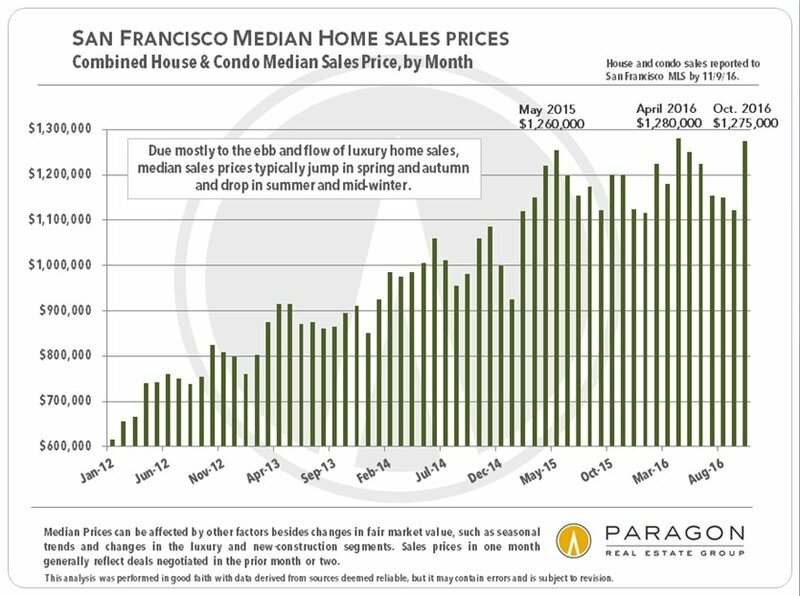 As mentioned above, the median sold price hit an all-time high in November. On a three-month rolling average, the median sold price is up 7.7% compared to last year. Inventory is down 23% from October and 19% compared to November, 2016. 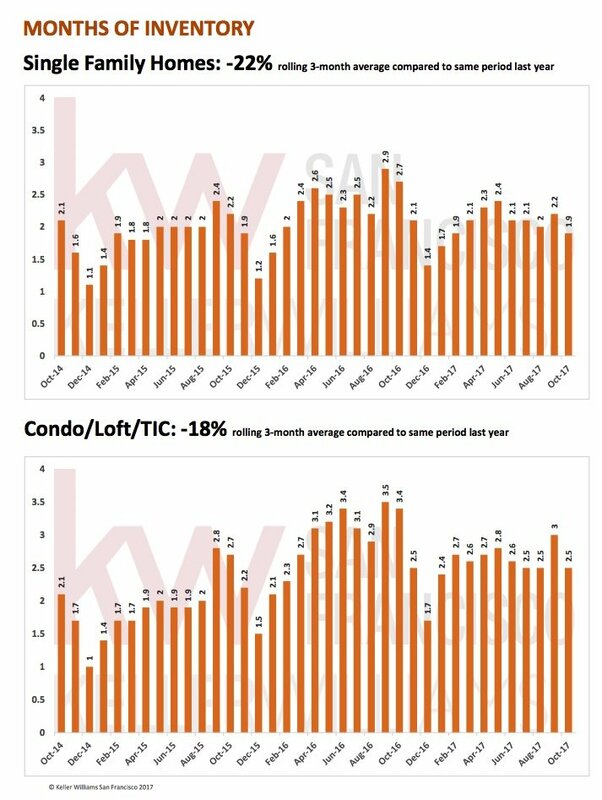 Like single family homes, the number of Condo/Loft/TIC listings are down year-to-date compared to 2016, by 5.6%, while sales are up 3.2%. 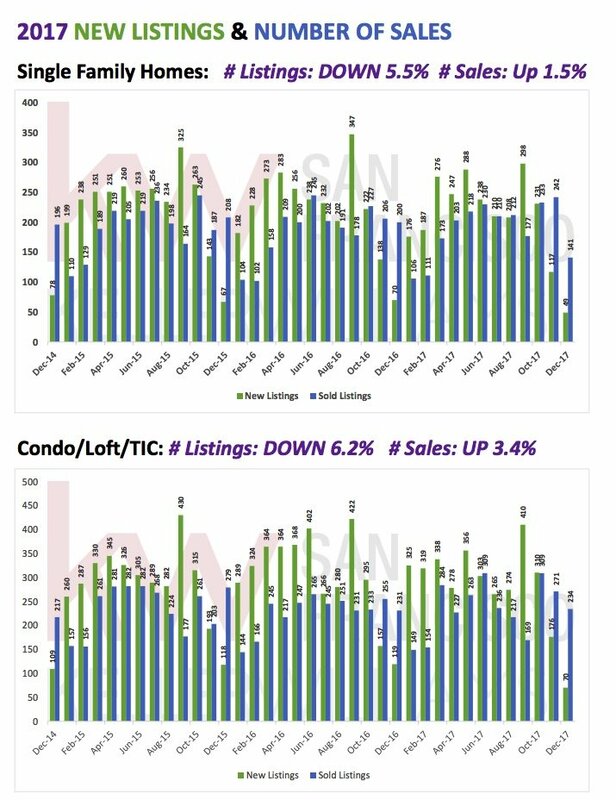 59% of condo/loft/TIC listings sold above list price, down from 67% in October and 64% last November. The median overbid was 102%, the same as last November. 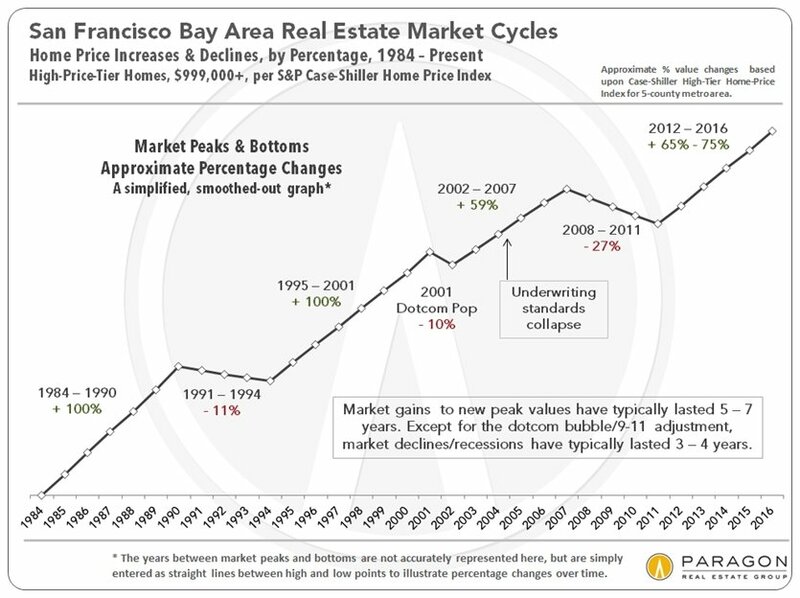 The Swiss bank UBS published its Global Real Estate Bubble Index recently, stating that San Francisco is the most overvalued real estate market in the US. 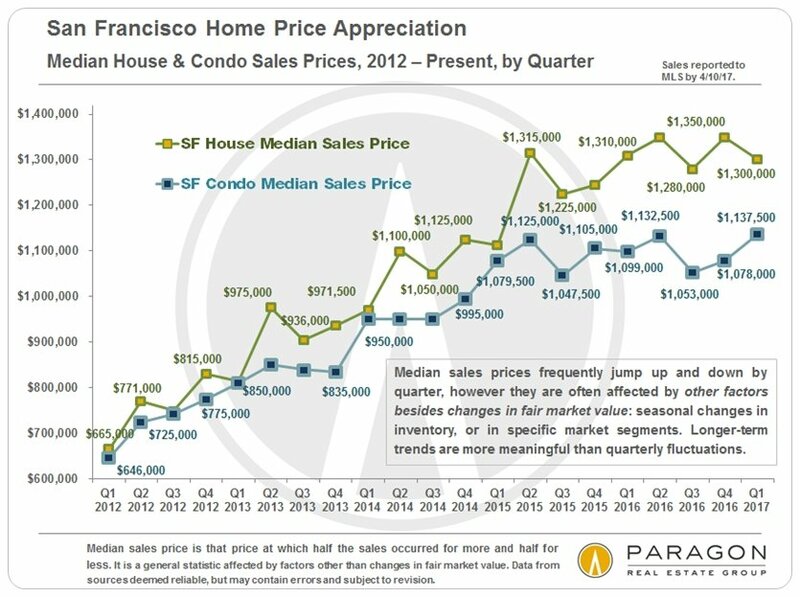 Their analysis focused on the rise of home prices in San Francisco compared to the rise in median incomes. Their report stated that home prices have risen 65% since 2012 while the average income has risen only 10%. 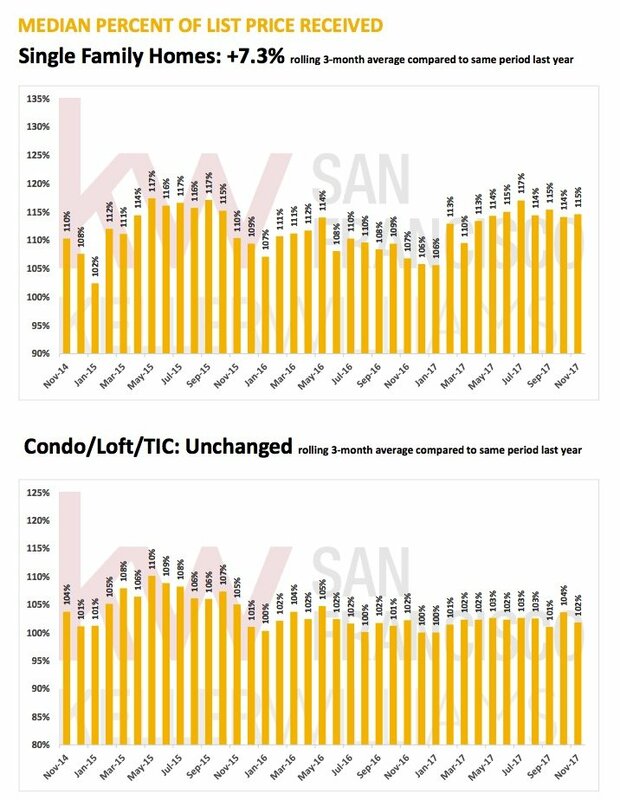 While they are, essentially, correct about the rise in the housing prices (taking both single family and condo prices into account), they are off on the income rise. Per the US Department of Commerce, median household income rose 42% from 2012-2016. While there is no income data out yet for 2017, we can safely assume that it has risen in 2017, given the incredibly tight job market. Therefor, income appreciation has lagged at least 40% behind housing cost appreciation, resulting in a significant drop in housing affordability. October’s median sales price jumped sharply to an all-time high of $1,588,000, up 13.4% above October, 2016. 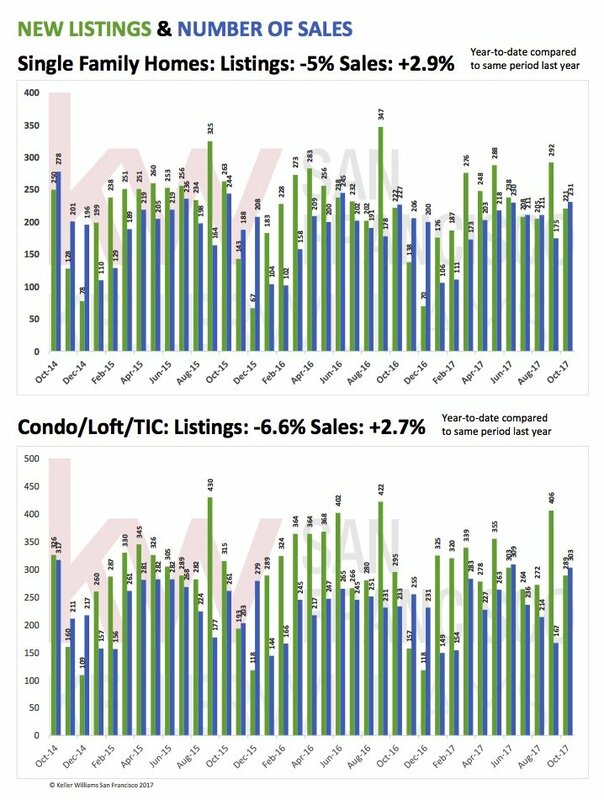 The number of new listings on the market year-to-date is down 5% from 2016 while the number of sales is up 2.9%. This has caused inventory to drop 29% compared to last October and is at its lowest level, 1.9 months, since February. 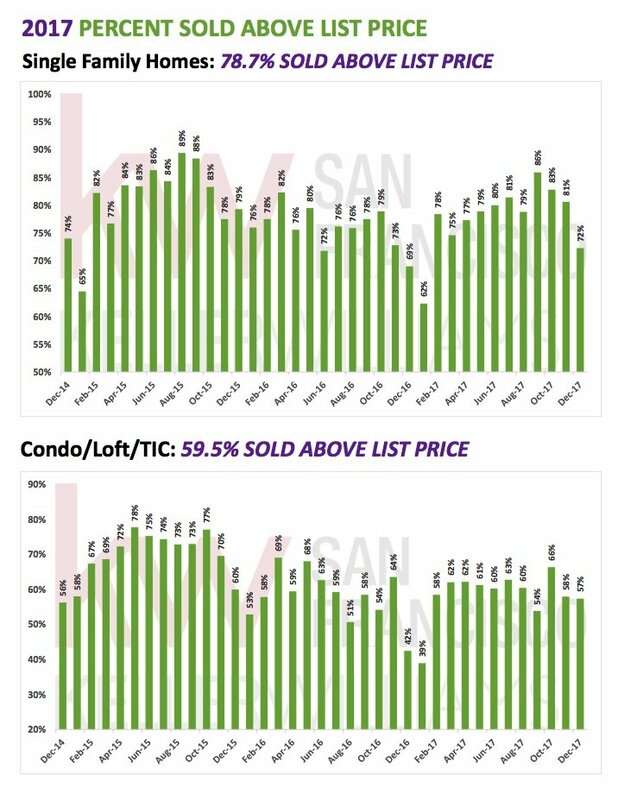 The incredibly tight supply coupled with strong demand kept the level of overbids high as well, up to 115.6%, higher than last October’s 108%. 83% of single family homes sold above the list price, and the median sales price was 113% of the list price. 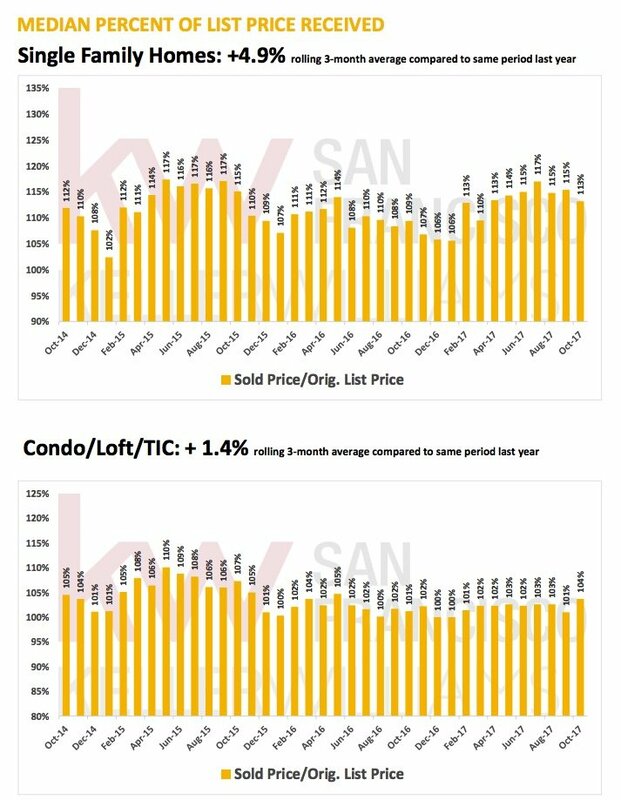 Median sold prices are dead even with last October’s at $1,140,000. They are up 5.8% on a 3-month rolling average compared to last year. 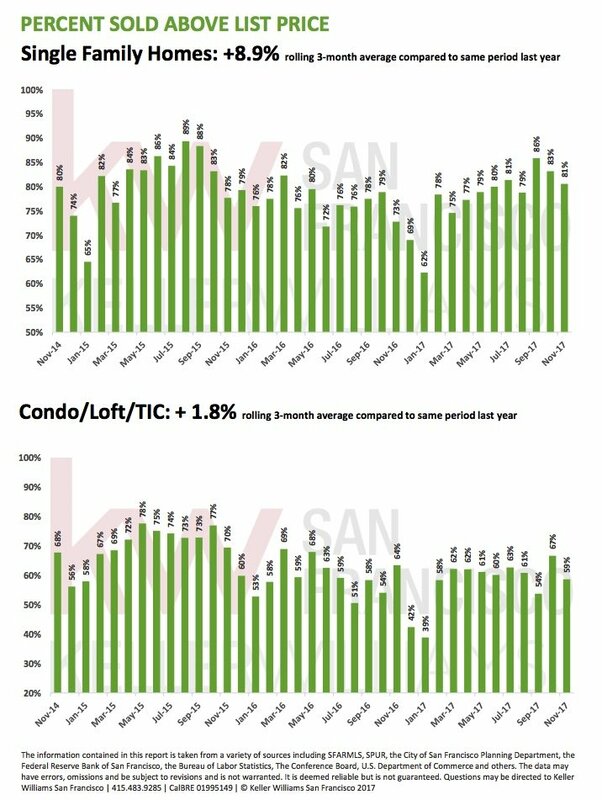 Following a very big month in the number of condo/TIC sales, 303, inventory is down 16% from September and 26% compared to last October. 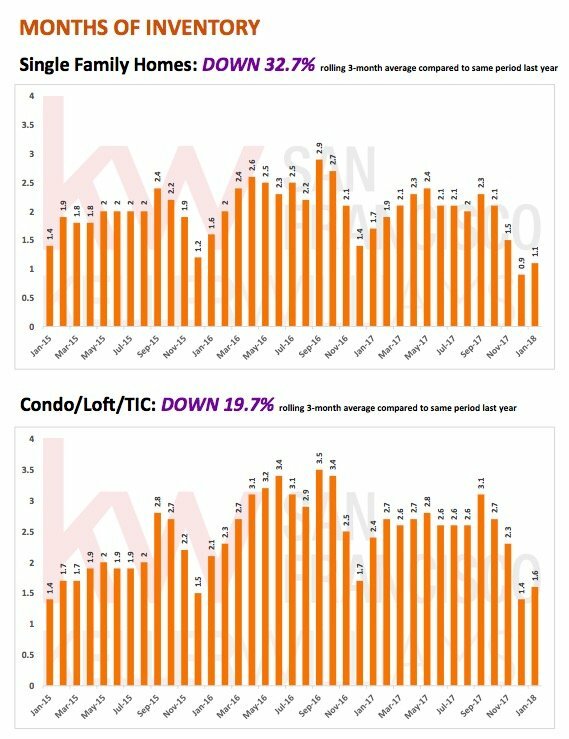 Like single family homes, the number of Condo/Loft/TIC listings are down year-to-date compared to 2016, by 6.6%, while sales are up 2.7%. 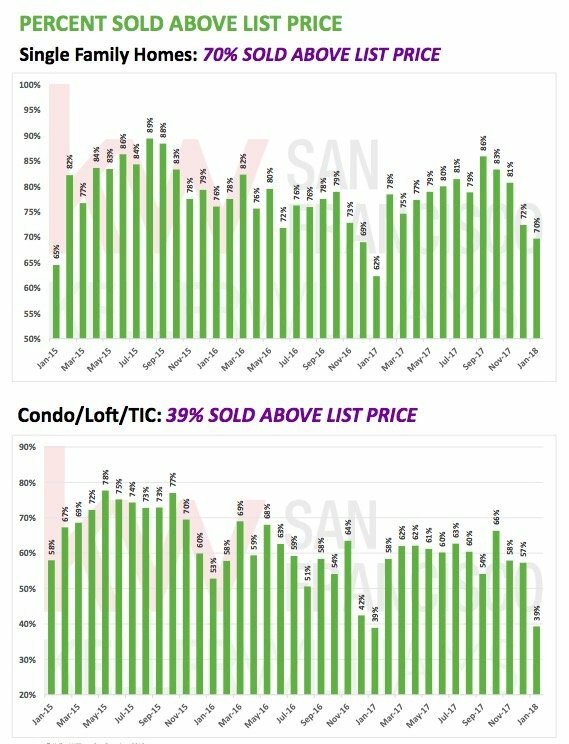 The flurry of sales brought sold prices up above list prices, to 104%, the highest level since May, 2016. This compares to this September’s 101%. And, 67% sold above list price, up from 55% in September. I can’t say enough nice things about Julie!